New cabinets have the power to completely transform a kitchen or bathroom. Deciding to get new cabinets is one of the biggest decisions you will make in any renovation project. One of the biggest draws to updating cabinetry is a vast improvement in functionality and storage capabilities. Timco Construction is a licensed dealer for Waypoint Living Spaces®, giving us the ability to create custom cabinetry to add the finishing touch on the kitchen or bathroom of your dreams. When deciding on a material for your kitchen or bathroom cabinets, the choice made will determine the aesthetic qualities of the finished cabinet. By determining the characteristics of the individual woods used in building the finished cabinet, you can tailor the finished product to meet your needs. All of our custom built cabinets come in a variety of design options and finishes. Cherry – Characterized by red undertones, cherry wood cabinets add warmth to the rooms they are featured in. The smooth grain on this particular wood type allows for easy finish application. With exposure to light, cherry wood will darken with age and giving an often desired patina. Maple – Predominately a cream color, maple wood comes in a variety of finishes. Given the grain of maple wood, cabinets built with this material are easily stained, glazed or painted. Resilient by nature, maple can typically be found to have a more unified graining as opposed to other wood types. Hickory – Dramatically colored naturally, hickory has a distinctive look due to heartwood and sapwood differences. Due to the natural contrast, hickory has been a favorite wood type in kitchen applications. With the addition of natural knots and mineral streaks, hickory has an unmatched natural beauty. Oak – With a range of color from white to reddish hues, oak has been a prominent material in furniture construction for years. Mineral deposits within the wood create interesting streaks of color irregularities for a desirable rustic look. Thermofoil – Thermofoil is created by thermoforming a plastic material to conform to an engineered wooden core. Noted as an economical choice for a new cabinet design, thermofoil does have its limitations. With its susceptibility to heat damage and moisture retention it is recommended to keep heat producing appliances at a safe distance from this cabinet type, however heat shields can help remedy the problem. Glass – Glass inserts can be used to give your cabinet door an interestingly unique visual appeal. The addition of transparent glass can make your room feel more open by creating the illusion of space and allowing items to be more easily found. Hardware – Nothing can make a cabinet door more personal than choosing the hardware that fits your design preference. As a dealer for Waypoint Living Spaces®, we have the unique opportunity to offer a multitude of different hardware options. Whether you are looking for a unique knob or pull, we are sure to offer a color and design to satisfy even the pickiest shopper. Molding – Creating a unique cabinet look through the use of molding buildups can drastically improve your finished cabinets. Molding also has the ability to bridge the gap between the top of your cabinet and the ceiling, effectively removing all visible empty space. If you are considering new kitchen cabinets, you are probably also looking for a new way to organize your dishes or pots and pans. With breakthrough organizational options that can be inserted into your custom cabinet system, you will never be left searching for specific items. Many different options are available to fit your organizational needs. Pegged Dish Organizer – By creating a pegged system to fit your various dish sizes, this pull out drawer can reduce clutter and organize the dishes you use most frequently. Pull Out Wastebasket – Pull drawers custom sized for waste baskets can open up usable space within your kitchen or bathroom by concealing waste baskets until desired. Deep Roll Out Trays – Tiered full extension trays allow you to organize your pantry in an efficient and easily searchable manner. Items will be visually available whenever needed. Wall Top Hinge Cabinets – Wall top hinge cabinets can help reduce clutter on counter tops by creating a storage area for appliances that are currently being unused. Every cabinet Timco Construction installs is built with the highest quality standards to make sure it will last for years to come. As a Waypoint Living Spaces® dealer, you can rest easy knowing that your cabinets were built with the best quality materials available in an American factory. All of the cabinets we install have joints that are pressure-fitted, glued, stapled and double-doweled to ensure the integrity of your cabinets will never be compromised. Face frames are also kiln-dried so the hardwood will never warp. 1/2-inch thick plywood sides, bottoms and floors are designed to exceed any load standard required for cabinet construction. Meeting or exceeding standards set by the Kitchen Cabinet Manufacturers Association and American National Standards Institute, your cabinets will function to peak performance. 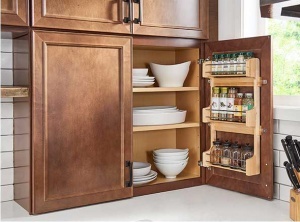 With the addition of cushioned hidden hinges and glides, these cabinets can withstand the wear and tear of continued use. This breakthrough in technology keeps your cabinet doors from slamming and dampens noise. When you partner with Timco Construction to update your cabinetry, you are receiving a product that has been created with environmental protection in mind. All cabinets installed by TimCo Construction are manufactured in a manner that protects the environment. The Waypoint Living Space® factory has obtained certification for air quality, product resource management, process resource management and environmental stewardship on all products manufactured. By encouraging sustainable forestry practices and limiting emissions and waste, your cabinets are being made with as limited environmental impact as possible. If you are in need of a new cabinetry system for your kitchen or bathroom, Timco Construction would love to explain our custom cabinet options in greater detail. To find out more about our cabinet options, contact us, or give us a call at 918-779-7330.